Our range of products include ureteral double j stents. Being a client centric firm, we ensure high quality Ureteral Double J Stents is delivered to the customers. 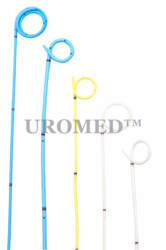 Our range of ureteral stents is thin catheters threaded in to segments of the ureter that carry urine from the kidney, either down into the bladder internally, or to an external collection system. They are manufactured using high quality raw materials procured from the most reliable vendors of the industry. They are demanded across the globe and are widely used in medical purposes. The range of Urethral Double J Stent is available in 3.0 french to 8.0 french size and 8.0 cms to 30.0 cms length. Looking for Urology Stents ?